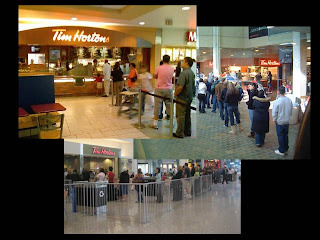 If you are from or have ever been to Canada, you know of a phenomenon like few others on earth. It is a cultural and business marvel. And it is named after a legendary hockey player who was one its co-founders. The Tim Horton’s coffee company is one of the most successful franchise models and continues to expand into the U.S.
Years ago when the scientific community was all a flutter about the possibility of former life on Mars, they could have easily saved years of research by simply opening a Tim Horton’s on the Red Planet and waited for the line-up to form at the drive-thru’. What the company does best is stick to what they do well. It amazes most experts that they can introduce new products all the time and all the while sell hundreds of thousands of gallons of coffee each year. What is equally amazing is that most of their customers (present company included) have perfectly good coffee makers at home, but prefer to line up with their fellow java junkies for a cup of Tim’s finest. The future of building relationships and product awareness is through brand experiences customers can share with each other. It is getting increasingly more difficult to rest a sound business plan on financing options and color selection. People want more. But in the case of Tim Horton’s, it’s not the most exotic coffee on the planet; it’s certainly not the fanciest joint on the block. However, while others try to dress up their customer experience with high back padded arm chairs and CDs featuring acoustic compilations, sometimes the right model is to get your customers in and out of your store with exactly what they want and expect from you. For that, they will line up.